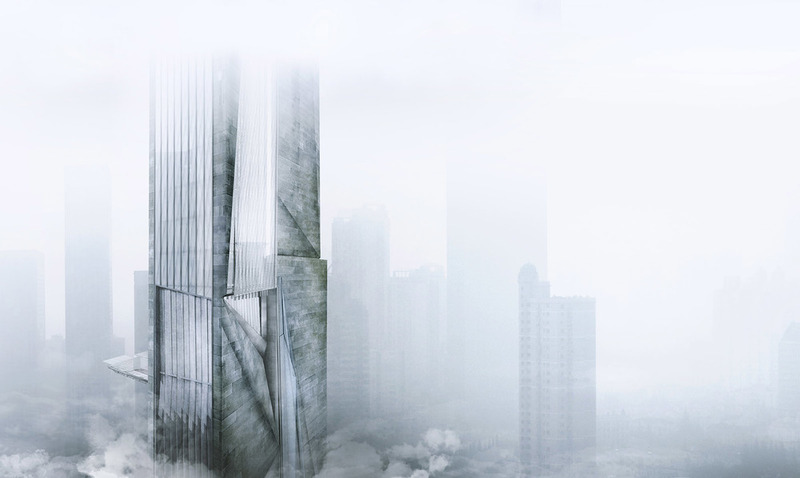 The concept tower, submitted to Evolo Competition, is designed as a possible solution for the inadmissible level of pollution in Beijing. In the tower are used technical devices and equipments now available and already tested. These technologies, in the construction of new buildings, could actively contribute in decreasing smog and carbon emissions through small and capillary networks of filtering stations that breathe pollution and clean the air. The first filtering is through extensive macro barriers and air vents on the sides of the building. Cultures of algae are present inside vertical tanks for the reduction of C02 and with the use of eco-cement in facade is possible to activate the photocatalytic process in the air. The forced ventilation ejects clean air by the top of the tower, at the end of a treatment cycle. The presence of a skygarden, as meteo station, reveals pollution compounds through bio-Lichens, a monitoring system now used by biologists in proximity to polluted areas where the death of specific lichen families indicates the toxins present in the air.